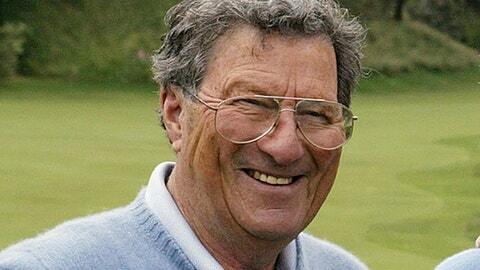 Hailed as a hero to some and as golf royalty to others, Peter Thomson, a five-time winner of the British Open and the only player in the 20th century to win the tournament for three straight years, died Wednesday. He was 88. Thomson had been suffering from Parkinson’s disease for more than four years and died at his Melbourne home surrounded by family members, Golf Australia said. The first Australian to win the British Open, Thomson went on to secure the title five times between 1954 and 1965, a record equaled only by American Tom Watson. The Australian’s wins came in 1954, ’55, `56, again in 1958 and lastly in 1965 against a field that included Arnold Palmer and Jack Nicklaus. Only Harry Vardon, with six titles between 1896 and 1914, won more. Thomson also tied for fourth at the 1956 U.S. Open and placed fifth in the 1957 Masters. He never played the PGA Championship. In 1998, he captained the International side to its only win over the United States at the Presidents Cup at Royal Melbourne. From Britain, R&A chief executive Martin Slumbers praised Thomson’s plans for the game’s future. Born in the Melbourne inner-city suburb of Brunswick on Aug. 23, 1929, Thomson was a promising cricketer. He scored an unbeaten 150 runs for the Carlton club against a men’s side as a 15-year-old. But golf became his passion, and he turned professional in 1947. He won the national championships of 10 countries, including the New Zealand Open nine times and Australian Open three times. He first played on the PGA Tour in the U.S. in 1953 and 1954, finishing 44th and 25th on the money list, respectively. He won the Texas International in 1956. Thomson won nine times on the Senior PGA tour in the U.S. in 1985, topping the money list. His last tournament victory came at the 1988 British PGA Seniors Championship, the same year he was inducted into the World Golf Hall of Fame. Overall, he won 26 European Tour events, 34 times on the Australasian PGA tour and 11 on the seniors tour in the U.S, as well as once in Japan. In later years, Thomson wrote articles for many publications and daily newspapers, was club professional at Royal Melbourne and designed more than 100 golf courses. In the 2011 Presidents Cup program, Thomson provided an insightful hole-by-hole analysis of the composite course at Royal Melbourne. Thomson was always reluctant to compare his wins with anyone else’s. ”All records are qualified in that they were made at a certain time in history,” Thomson told golf historian and author Brendan Moloney for a story on his 80th birthday. ”The circumstances change so much, and so do the players’ attitudes. In golf, only in the last 30 years or so has there been a professional attitude to playing for money. The professionals in the USA and Britain and anywhere else all had club jobs as a backstop to their income. Thomson always had stories to tell, and told them well. With a full head of hair and a lineless face that belied his age, the Australian wasn’t afraid to let everyone know his feelings on any subject. That was true as far back as 1966. As president of the Australian PGA, Thomson was indignant that Arnold Palmer’s prize for winning the Australian Open was only $1,600, out of a total purse of $6,000, one of the smallest in golf. But he was always happy on the golf course. Thomson served as president of the Australian PGA for 32 years and worked behind the scenes for the Odyssey House drug rehabilitation organization where he was chairman for five years. In 1979, he was made a Commander of the Order of the British Empire (CBE) for his service to golf, and in 2001 became an Officer of the Order of Australia (AO) for his contributions as a player and administrator and for community service. Thomson is survived by his wife Mary, son Andrew and daughters Deirdre Baker, Pan Prendergast and Fiona Stanway, their spouses, 11 grandchildren and four great-grandchildren.